They say that when it rains, it pours. Why is that? Why do bad things come in threes? Why do things go from bad to worse? Why does the universe always seem to kick us when we’re down? This time of year, when the days are short and cold, it can be easy to find yourself in a dark place. And that’s when the powers that be decide that it would be a perfectly good time for several of the following to happen all at once: Getting sick. Getting hurt. Getting into a fight. Getting into an accident. Losing your job, your life savings, your dreams, and finally, your mind. Why must everything hit us all at once? Is there any reason for it, and more importantly, is there any way to avoid it? Of course, bad things don’t only happen during this time of year, but they do tend to happen when we’re feeling down. And this year—due to the state of the economy and the world in general—many of us were more down then usual…and seemed to experience more trying times than usual. What gives? Well, I think there are a few reasons for this phenomenon, and I also think that all of them offer an escape route. If like attracts like, then what we don’t like attracts more of what we don’t like. 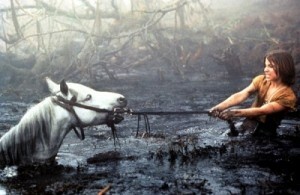 Many of us know this, and yet, still fall into the trappings of “The Nothing.” Remember that scene in The Neverending Story when Atreyu is trudging through the Swamp of Sadness after it’s claimed his horse, only to find himself being overcome by it as well? Once something negative happens to us, our mind often sinks into anger or sadness. This bad mood tends to attract more bad things and before long, we find ourselves in a funk. Who’s got the funk? You do. And the funk only leads to a downward spiral of despair. Like the Swamp of Sadness, the more we struggle against it, the deeper we sink into it. The solution? Don’t fight it. Leave a space for your anger. Get it out. Then do something to get above it. Go for a run. Workout. Write down your feelings. Do yoga. Throw a ball around. Create something. After you’ve cooled down, envision the clinging negative attachments falling away from your body. In fact, physically brush them away from you or take a shower or bath. If you find yourself sinking again, notice yourself doing it, and then, just give some thought to what’s going right in your life. This is your best defense against falling into a vicious cycle of negative events leading to negative thinking leading to more negative events. If all else fails—just laugh. Even if it’s a maniacal, “I’ve totally lost my mind” kinda laugh, it’ll still release endorphins and get you smiling again. Get nothing but coal in your stockings this year? Well, put enough pressure on that coal and you’ll get a diamond. Many times, when crap happens to us, it’s just because we haven’t been proactive enough on our own. Since we haven’t been challenging ourselves enough, the universe does it for us. It’s the only way to grow. And every single one of our destinies requires growth. In fact, this is the wisdom behind the coal in the stockings myth. You didn’t grow enough so you were “bad.” It’s also the spiritual explanation behind the whole Chanukah story. Why do Jews eat oily potato knishes and doughnuts on Chanukah? To remind them of the miracle of the oil that lasted eight days. And where did this oil come from? From olives. And what do you have to do to these olives to get oil? You put pressure on them. Jews then light candles to remind them that the tiny flame of a candle can light up an entire room. Just make room for a little bit of light, and you’ll get more. It’s that Law of Attraction thing again. All of our holiday rituals and stories are based on spiritual truths meant to help us. The coal and the olives are meant to remind us that challenges will make us stronger in the long run. But admittedly, this concept offers little solace during trying times. The solution? Once we’re getting bombarded by challenges, the best we can do is stay positive, know that it’ll pass, and that we’ll get through it. It’s often helpful to envision the best possible outcome. This is exactly the opposite of what we usually do. Faced with obstacles, most of us usually think of the worst-case scenario and try to think how we will handle it if it happens. Then, sure enough, that outcome often does. Instead, envision the outcome you want to happen. Of course, the very best way to deal with multiple challenges, is to avoid them to begin with. To do that, we must be proactive and make sure we are constantly challenging ourselves. We do this by learning new things, going outside our comfort zones, and challenging ourselves beyond what we think we are capable of. If you find your life getting routine, if you’re bored and don’t find many challenges in life anymore—go out and create some. Or the universe will do it for you. How many times have you seen a movie where the hero is suddenly in some deep trouble, and then, they are in even more trouble and you think, “how the hell are they gonna get out of this one? And just about every time, what do they do? They use the two negative things against each other. So the hero finds himself unarmed and his nemesis shows up with a gun, and if things couldn’t get worse another armed nemesis shows up. Both fire their guns and the hero ducks and the two villains end up shooting each other. You’ve seen versions of this hundreds of times. Just the other day, Ice Age 2 was on TV. I caught it right at the scene when Manny, the wooly mammoth, is swimming underwater trying to save his new love Ellie who is trapped in a cave that’s become flooded. He wedges a log into a crack in the cave but it won’t budge. Just then, a gigantic sea monster spots him and begins darting right towards him. So what does he do? He pushes himself upward off of the log, causing the sea monster to smash into it, knocking the monster unconscious, moving the rocks, and freeing Ellie. Two negatives equaled a positive. Works great in the movies, but how can you work this kind of magic in real life? The solution? Yes, the movie versions are just meant to teach us the lesson, but real life often doesn’t go as smoothly. But many times, when we find ourselves bombarded by obstacles, with a bit of creative thinking, it is possible to have them cancel each other out. The kids are cranky and you have tons of chores to do? Make a game out of the kids helping you with them. You’re running late for a job interview and a car splashes mud on your coat? Walk in completely calm and joke to the interviewer how you feel it’s the perfect way to illustrate how you remain calm under pressure. Getting overwhelmed writing a 1,000 page book only to have your computer completely die on you? Use the opportunity to write another book and then get back to the original one after you’ve had a bit more experience. I have a couple frames from an old Spider-Man comic on my wall. In the first frame, Spidey is fighting off some bad guys and one of them spills grease on the floor to trip him up. In the second frame, Spidey uses the oil to slide past the villains, knocking them over and says, “According to the latest super-hero manual, the well-trained costumed crime fighter turns every obstacle into an advantage!” While Spidey did use two negatives against each other in this case (the villains and the oil slick) as he points out, this trick doesn’t require two negatives to equal a positive—any negative can be turned around! So the next time you’re faced with overwhelming obstacles, see if they can be used against each other, or at least, turned around into an advantage. If not, try to see how these challenges might help you in the long run. If all else fails, do your best to stay positive and remember, this too shall pass. Just as we want to see the movie hero overcome his challenges, so too does the universe want you to succeed. But at the same time, it wants a good movie, and who wants to sit through a movie where everything goes right for the hero from beginning to end? A hero suffers. They just don’t let the suffering stop them. The long-awaited orowriter.com website and Layman’s Answers to Everything blog is coming soon! My hope is that this will allow all of us to benefit from each other’s wisdom with posted comments and exchanged ideas. In the meantime, check out themythoflost.com for videos, columns, and commentary on various myths in the media! 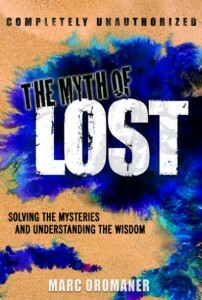 The Lost book is called, The Myth of Lost: Solving the Mysteries and Understanding the Wisdom. It not only reveals a solution that explains all the mysteries of the show, it also explains how the show’s wisdom can be applied to our real lives. Wow, most impressive that you were able to even find this being that I haven’t officially announced it yet! It’s pretty much done, but I just have to take care of some technical things like favicons and RSS feeds and stuff. I will probably have an official release next month, along with the orowiter.com website which isn’t published yet. Thanks for the warm wishes and hope you have an enlightening year as well!